Facing across SW Park Avenue, Doyle operates a borrowed projector during the test of Presto! in Portland, Oregon, on August 8. Click image to enlarge. “I can tell you from experience that we should expect a series of crises tonight,” said Chris Doyle ’81 wryly, plopping down his duffel bag on a late-summer morning to wait for a cab. He had just arrived at the airport in Portland, Oregon, after a string of overnight flights originating at the airport in Portland, Maine. In 36 hours, his new artwork, Presto!, would debut at Converge 45, a burgeoning arts festival he helped found. It’s a piece of digital animation, and Doyle’s plan is to project it from a van onto walls around the city—an approach he has never tried. “Tonight” means a public rehearsal and troubleshooting session, using unfamiliar equipment on unfamiliar streets. Doyle has spent months corresponding with Cris Moss, a local artist and University of Oregon (Portland) curator, about set-up and planning. But plenty of practical questions remain: What kind of lens does the rented projector have; will the rented minivan’s engine generate enough DC current to power the projection? Also, all the local art students who’d promised to assist have dropped out. Would I, he asked, be willing to lend a hand if needed? After leaving off our bags at his hotel in Portland’s Chinatown—like the rest of the city, a mix of old-timers, new money, and artists—Doyle and I hit the streets to shake the travel out of our legs and get the lay of the land. To the west, a steep bluff rose into view: It was tree-lined and, based on the roofs peeking through the leaves, residential. Clearly it was not the place to project videos “guerrilla-style,” as Doyle described his plan. But he liked its presence for a practical reason: Presto!, like any video projection, works only in darkness, and the bluff would probably cast a long early shadow on the city, countering the late-setting August sun. Trying out Presto! on the wall of the Pacific Northwest College of Art, August 8. Click image to enlarge. To the east lay the Willamette River. In formerly industrial cities like Portland, Doyle noted, that normally would mean a district of warehouses—movie screens made of brick, essentially—but in the 1970s Portland had torn down most of its warehouses to make way for a soaring interstate overpass. The buttresses created a barren district devoid of human life—no place for Presto! either. But Chinatown proved fertile ground. A wave of demolition and new construction had peppered it with empty lots lined with the blank walls of adjacent buildings. Passing a property whose walls had been prettified with a coat of white paint, Doyle smiled: “That ticks a lot of boxes,” he said. Presto! had found its first home. In the car from the airport, and in conversations and visits we’d had in New York over the previous months, Doyle described Presto!—its intellectual origins, its practical manufacture. Practically speaking, it’s a sequence of four animations, rendered on computers by Doyle and an assistant using a technique called rotoscoping. One of the oldest forms of animation, it’s done by tracing real-life footage frame-by-frame and then altering and augmenting the tracings according to the artist’s inspiration. The Portland Art Museum on opening night, August 9. Tossed, the fish will morph into a missile, among other things. Click image to enlarge. In Presto!, a pair of disembodied hands performs a series of impossible magic tricks: spinning coins in midair like orbiting planets, tossing objects that meld and morph as they pass from palm to palm, turning two folded dollar bills into one. The coins and objects spring from Doyle’s imagination, and the hands, though they’re traced, are now inhuman: Doyle has painted them in neon colors and overlaid them with shifting graphic patterns. They’re fantasies, maybe nightmares. Chris Doyle came to Boston College from northeastern Pennsylvania, where his family settled after several years of annual uprootings. (His father sold heavy construction equipment and requested frequent transfers as a way of moving up the ladder. “By the time I was seven years old, I’d lived in seven houses,” Doyle recalled.) His mother raised Doyle and his siblings—four boys and a girl, Doyle the second-born. 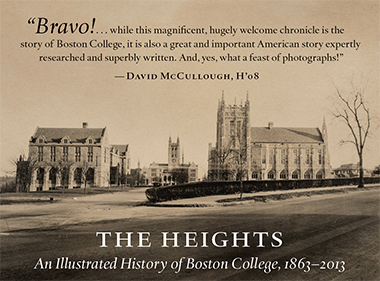 Their home was “on the edge of suburbia, where the suburban meets the rural,” and Boston College, where the suburbs meet the city, struck him as a good place to begin exploring urban life. He graduated in 1981 with a degree in fine arts, after initially planning to study biology, “primarily because I thought that you should go to college to learn something you didn’t know that well.” But he’d always been artistic, and courses in watercolor and printmaking his sophomore year set him back on his natural path. He went on to earn a master’s in architecture at Harvard University—a practical more than a passionate effort, he says. By the mid-1980s, supported by work-for-hire jobs in architectural firms, he was pursuing the life of an independent professional artist. Backed in due course by major galleries and collectors, regularly commissioned publicly and privately, and selected as a Guggenheim fellow in 2014, he is now on the high slopes of his field. For much of the last 10 years, Doyle has been immersed in a series of five complex works that center on digital animations; they are perhaps his signature work. He was inspired by The Course of Empire, a set of five paintings by the American artist Thomas Cole, completed in 1836, during the Age of Jackson. Cole’s Empire depicts a cycle: Wild nature is transformed by man first into beautiful farmland, then into a shining city, which soon falls into war and finally into abandoned ruins. It reflected Cole’s, and the country’s, hopes and fears for the nation, which even then was clearly on its way to becoming a global power. Doyle’s multi-screen Bright Canyon debuted July 1, 2014, as part of the Midnight Moment series in Times Square. Image: Lovis Dengler Ostenrik for @TSqArts. Click image to enlarge. Beginning with Waste_Generation (2010), and continuing through Idyllwild (2012), Bright Canyon, and The Fluid (2014), Doyle explored many of the same themes Cole had nearly two centuries before. The final piece, Swell, debuted this fall, part of a one-man show at the Catharine Clark Gallery in San Francisco; filled with scenes of industry and construction, it echoes Cole’s central panel, The Consummation of Empire, in which the city is in its Golden Age. But these are not 19th-century paintings, static and plainly allegorical. They are densely layered—visually and in terms of meaning. They have soundtracks, often commissioned from one of Doyle’s composer friends. And, of course, they move. But Doyle is not only a digital artist. He is an extraordinarily gifted painter, as I discovered when we met in his studio last May. Gazing on an 18-foot-wide triptych, The Larger Illusion, which hangs above his work table, I asked whether it was a print of something he’d created on a computer: It appears composed of thousands of small, perfect facets of color, the way digital movie monsters are. “No, that’s a watercolor,” he said. Most of us know watercolor as the medium of kindergarteners; if we even recognize it to be one of the fine arts, we largely relegate it to the back rooms—as the work of provincialists, nostalgic and simple and small. In fact watercolor is the most unforgiving paint. Oil and acrylic can be scraped off, painted over, revised, whited-out; correction is part of the process. Watercolor permits few mistakes. It seeps into the paper permanently. It can never be fully erased or painted over. Especially, it can’t be whited-out. Yet white spaces are often the heart of a painting: the gleam of an eye, the glint of a wave. In a finished watercolor, every white spot is a patch of bare paper—and that means the whole image had to have been planned to the last inch. That’s not easy to do in a painting the size of a manila envelope (as many watercolors are) or copied from real life (as many watercolors also are). The Larger Illusion is a photorealistic triptych of an imaginary forest composed of four-by-six-foot panels. I wondered how Doyle pulled it off. Doyle works out of his apartment in the Williamsburg section of Brooklyn, where he has lived since the early 1990s. His studio is lined with long wood-top desks, on which sit the computers he and an assistant use to create the animations; the north wall, made of glass brick, lets in soft light. Like most artist’s studios, it has a former life: It used to be the neighborhood barbershop. Doyle’s apartment sits at the heart of one of the last remnants of the “old” Williamsburg, in a sort of urban eddy tucked into the crook of the Williamsburg Bridge off-ramp. It’s the last toehold of a large Dominican community that predated the money and the tourists; there are fancy coffee shops and hip restaurants, yes, but there are also shabby all-night tiendas, corner shops where you can buy the paper and a pint of milk at 6:00 in the morning, before the hip joints open their doors. I mention all this because Doyle, despite his Pennsylvania countryside roots, is fundamentally a New York artist. And a week after Presto! opened in Portland, he took over more than 50 video screens in the vast Fulton Street subway station in Lower Manhattan, not far from Wall Street and the World Trade Center. One of the busiest stations in the system, Fulton Street sees more than 25 million commuters pass through each year. Like the more famous Grand Central Terminal, it’s a place where multiple subway lines converge—a hub with many spokes. But unlike Grand Central, it’s a thoroughly modern space, with glass walls and a central atrium that brings daylight four stories underground. And for at least the rest of this year, it will be Doyle’s canvas. The best happened: At the appointed hour, the screens stopped displaying ads and train schedules, and scenes from The Fluid glowed to life. On the mezzanine, two huge screens showed animated rivers and sandhill cranes, transforming the space into a dream-zoo. A circle of screens in the lower atrium displayed animated rain that slowly evolved into abstract patterns. Still more screens, displaying still other scenes, were out of sight in the tunnels below. Doyle’s idea was to present this cut-up and shortened version of The Fluid in the same sequence as the original, so that a commuter descending from the street to the trains would see it from start to finish. He hustled up and down escalators and stairs, checking that his plan was working. When it appeared to be doing so almost perfectly, he let out a relieved laugh. Still, he did note a playing-card-size section of one screen that was on the fritz, and caught some tiny glitch in the sandhill-crane animation that didn’t please him; he planned to fix it. “I can’t let anything go!” he said. Doyle, in his Brooklyn studio. His animation work, he says, has become “much more hand-driven.” Click image to enlarge. Doyle was inspired, he said, by a controversial work by Richard Serra, arguably the most influential sculptor of the last 60 years. In 1981 Serra had placed what amounted to a wall, made of 2.5-inch-thick, rust-skinned COR-TEN steel, across the plaza in front of the Jacob K. Javits Federal Building in Manhattan, the home of numerous federal agencies (today including the FBI and Homeland Security). Tilted Arc was a bold effort; it was also rude, forcing the people who worked in the Javits building to take a circuitous route daily to its doors. After years of controversy—a federal panel recommended that it be removed, Serra sued to have it stay—it was taken down in 1989. Doyle said that he respected Serra’s overt attempt to get people to alter, and therefore think about, their approach to government authority—the politics of the piece—but that he also found Tilted Arc “profoundly ungenerous.” Commutable was his effort to be generous and political in his own way. After all, the Williamsburg Bridge pedestrian lane, like the Javits building’s plaza, was a gateway to work; it was the gateway for those Brooklynites too poor to take the subway to their jobs in Manhattan. As well, Doyle recalled, at the time he made Commutable, a number of prominent but outdated civic sculptures, of the 19th-century “General on Horseback” variety, were being re-gilded; the contrast with the Williamsburg Bridge site, which was “literally covered in needles” dropped by heroin users, was stark. “I thought it would be nice to give the community some gold,” he told the Times. Doyle mused that Presto! “circles back, maybe, to Commutable“—it is “political but exuberant,” he said. That meant, explicitly, not calling the piece, say, Donald Trump’s Bag of Tricks. It meant disguising the president’s hands behind the eye-popping carnival tricks they perform: coins afloat, dollar bills disappearing. It meant delivering a Trojan horse, and giving the community some gold. Doyle, below ground during a test of The Fluid in the Fulton Street Station on August 24. Click image to enlarge. The dry run in Portland went well. The projector projected; the minivan, after some trial and error, was persuaded to deliver enough electricity through a DC converter to power the 700-watt bulb. I got pretty good at helping set the projector onto its tripod—better, anyway, than the AWOL art students who had originally agreed to the job. The air itself cooperated. Uncommonly hot and humid, and thick with the smoke of forest fires drifting down from British Columbia, the ether caught the projector’s beam and gave it an eerie solidity, like a spotlight. And Doyle was right about the bluff: Official sundown wasn’t until 9:30 or so, but downtown was in shadow by 8:45. As the darkness deepened, Presto! glowed ever brighter on the wall of the empty lot in Chinatown. Passersby stopped, stared, proclaimed it cool. Even the angry stranger behind us, leaning against his car and yelling into his phone—a domestic dispute made public—played a role: Like a circus barker, he attracted eyeballs. The experiment was sufficiently confidence-inspiring that Doyle would go on, later that week, to project Presto! from the van as it glided around the city, “guerrilla-style,” just as he’d envisioned. First, though, came the festival opener, the next night. Doyle wined-and-cheesed for a few hours with Converge 45’s backers in the courtyard of the Portland Art Museum; I met him as the confab wound down and the crowd began to thin. He wanted to put Presto! up while people were still around, and as we waited anxiously for his collaborator Cris Moss to arrive, Doyle became contemplative. “The thing is, art has no intention,” he said. “That is what makes it optimistic.” Then Doyle realized that we didn’t have to wait at all: He had the keys to the van; we could set up the projector on our own. A few minutes later, Presto! was a living work of public art, glowing on the wall of the museum. The Fluid runs for two minutes on the hour, day and night. Click image to enlarge. We were set up at the edge of a city park, in a nice part of town; people were out for evening strolls. A trio of stylishly dressed women stopped to watch. Doyle drifted toward them. What is it, they asked? An entry in the festival. Did you make it? I did. How? I hand-animated and digitally manipulated it. The women drifted off, but one stopped and looked again, then took a few steps and looked a third time. Was there something familiar about those hands? Tim Heffernan is a writer based in New York City.